To reset your password, please enter the email you registered with below. We'll organise for a new password to be sent to you. Sorry, we couldn't recognise your Email or Username. Please try again. To recover your username, please enter the email address you last remember being associated with the account. We will then email you your username if we match your email in our database. Email sent! The email should arrive in your inbox shortly. Trade your term deposits at your convenience with our online platform. From your instruction, funds will move directly between banks, always remaining in the account name. 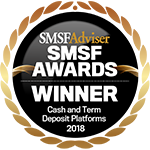 Australian Money Market is proud to be awarded as SMSF Adviser’s best Cash and Term Deposit Platform for three years running. 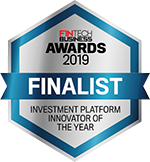 Proud to be recognised amongst Australia's leading organisations in the financial technology sector, AMM has been shortlisted for Investment Platform Innovator of the Year. To view all the interest rates from over 20 banks and financial institutions, login and enter the amount you wish to invest. Who is Australian Money Market? 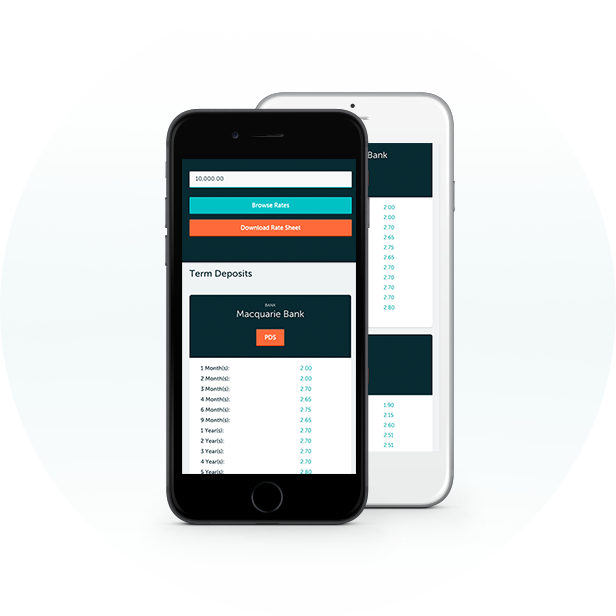 Find out more about AMM and our online term deposit platform - view our 2 minute video. Find out how we take the paperwork out of your term deposit trading - view our 2 minute video. 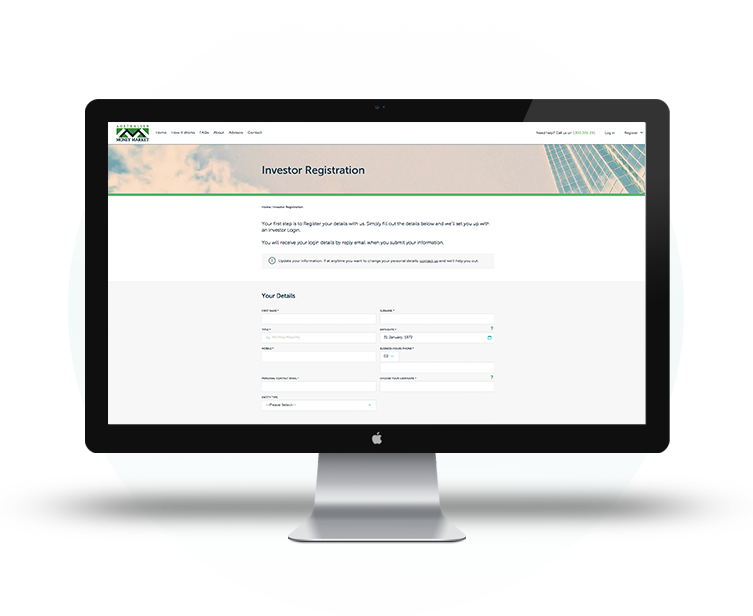 You need to register your details with us and we’ll set you up with an investor login to access rates. Complete our online application form to set up your AMM Client Account in your investing entity’s name. A required Cash Management Account can be set up as part of your application process if you don’t already have one. Once you have transferred funds to your Cash Management Account which acts as a “hub” for investing, you can browse rates and start placing term deposits through our platform. Centralised access to interest rates offered by more than 20 Australian banks, building societies and credit unions – all of which are Authorised Deposit-taking Institutions covered by the Australian Government Guarantee Scheme up to $250,000 per entity and institution. Compare and choose rates and terms from more than 20 Australian financial institutions. There are no fees to use our service. AMM is paid by the institutions and the rates on offer through the platform are what you will earn. No more researching rates with individual financial institutions and no more paperwork! Funds are always held in the investor’s name and funds move from bank to bank. Ownership of the funds cannot be transferred to anyone else and no monies are held on trust. Avoid having your funds automatically re-invested at lower rates with the same institution. We notify you prior to maturity and it’s easy to browse rates and invest with a different institution. Whether you are at home, work, holiday or on the move, you can connect and transact via computer, tablet or smart phone. Your instructions will be processed during our standard dealing times. AMM is not a bank, but an online broker. We were the first in the Australian marketplace to build a fully transactional online term deposit platform in 2007. Since then funds under management have grown to over $5 billion. We have procedures and processes in place to make sure that the security of your funds are never compromised. That’s our promise to you. The funds ALWAYS stay in the investor’s name and move directly from bank to bank. Now that’s reassuring. Minimum 128-bit SSl encryption for the transmission of data so you can be rest assured your information is secure. Constant audits as well as hourly offsite backups ensure that your transactions are never lost, even if disaster strikes. Your personal information is safe and secure. We use GeoTrust for transactional security. "Having a platform as you do, is an enormous time saver for me as documentation does not have to be provided with each institution separately. I hope that ‘Australian Money Market’ goes from strength to strength & look forward to doing many more transactions with you." "Managing my term deposits through AMM has changed my life - no more researching rates and no more paperwork"
"Something like this is good because it’s doing it all for you." "Having the ability to switch between different term deposits after maturity without having to reapply and do all the paperwork is a real benefit. I’m finding as I get older I don’t want to do it anymore and I like to spend my time doing something else!" "With my term deposits electronically lodged, I don’t have to think about it." These are the questions that we receive most frequently however if your query is not answered here, please don’t hesitate to contact us – we are happy to help. 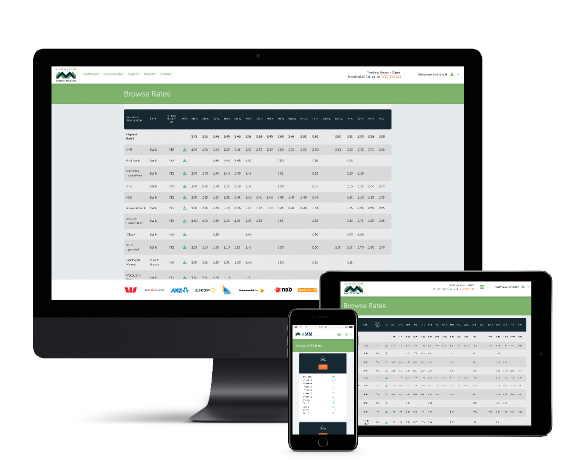 Australian Money Market Pty Ltd (AMM) is a private company that was established in 2007 to run an online cash deposit platform. AMM provides a brokerage service for our clients and their term deposit requirements. Is there a fee or cost to use the service? No fees are charged to our clients to use the services provided by AMM. AMM acts as a broker for term deposit products and other investments, and is paid a brokerage by the bank or financial institution providing the deposit product or investment. This brokerage is typically 0.10% but may differ per institution or deal type. The rates shown by AMM are net of any brokerage paid and therefore the interest rate you see will be the interest rate you will receive. Yes. AMM do not use trust accounts. The movement of funds between financial institutions is always in your name via your cash management “hub” account. All deposits are held with the deposit taking institutions you have chosen to invest with and remain in the investing entity’s name. At no time are funds held in any trust or custodial structures. If you choose to stop using the services of AMM, or if AMM ceased to offer any services, your funds would be unaffected and remain deposited with your chosen institution(s). What does it mean by AMM having a Power of Attorney (POA)? In order to automate the various functions required to open Term Deposits on your behalf, you provide an authority to AMM to sign bank applications on your behalf as part of each Term Deposit setup. Nothing is executed through AMM without your instruction. What is the Government Guarantee Scheme? The Australian Government has guaranteed deposits up to $250,000 in Authorised Deposit-taking Institutions (ADIs). The cap applies per entity, per ADI. All the banks, building societies and credit unions listed with AMM are covered by the Australian Government Guarantee Scheme on deposits up to $250,000 per person per institution. So if you place $250,000 with one ADI and $250,000 with another, then both of the deposits are guaranteed. If you place more than $250,000 with one ADI, then only up to $250,000 is guaranteed. In the case of joint accounts, each account holder is entitled to an individual guarantee up to $250,000. Do I get better rates than publicly available? Generally no - they are usually the same as rates offered directly to the public. There are some Banks that pay AMM’s brokerage on top of the rate publicly available, which means you get the same rate as if you dealt directly with the institution. Banks will also provide us with specials from time to time. The ability to easily switch between institutions on the platform, allows you to maximize the return on your investment. Is there a minimum amount required to invest? For each financial institution, there are different minimum and maximum amounts, dependent on rates and terms. These are specified by provider on the rates table which is accessible once you Register with AMM. What entities can invest through the AMM online platform? AMM is an online platform for investing in retail term deposits. We accept Accounts in the name of individuals, joint accounts, SMSF’s, and most companies or associations including charities and other trust structures. If you have a question regarding a particular entity type, please contact us. How do I set up an AMM Account? Firstly, you will be required to Register – just give us a few details and we will email your own login details. Once you have these details you can then complete our online AMM Account Application form to open up your AMM Account(s) in the legal entity name(s). This can be done via the ”Add New Account +” button on your Dashboard and this will take you through the various steps based on the entity type you are opening (ie individual/joint investor, company, SMSF, charity or trust). Please note, you can have more than one AMM Account under your AMM Registration which simplifies the management of your term deposits e.g. you may have term deposits under your own/joint name and also for a family trust. What identification is required to set up an AMM Account? AMM will require you to provide identification documents relating to the particular investor type that you are i.e. individual, group of individuals, SMSF, Trust or Company. Original copies of the identification documents will need to be certified and posted to AMM, along with your signed Account Application Form. (Please note, the copies must be clear and all characters legible). For a guideline to the Certified ID Requirements and Personal Details required by financial institutions, please click here. Who is Authorised to Certify ID? For a list of persons authorised to certify copies of identification (ID) please click here. Unless it is specified that the Authorised Person may be overseas, an Authorised Person must be either an Australian Citizen or Permanent Resident of Australia. Contact details of the “authorised person” can be either work or residential. Individuals certifying documents need to certify every page of the document. If they only wish to write on the first page, they must clearly state that they are certifying the entire document (i.e. all pages). What is a Cash Management Account (CMA) or “hub” account and why do I need one? In order for AMM to send the funds to your chosen institution, they need to be available in an account that AMM is authorized to debit from which is a Cash Management Account (CMA) or “hub account”. Upon your instruction, we move the funds out of your CMA and directly to the chosen institution for your selected investment. What if I already have an existing Cash Management Account(CMA)? We can link an existing Cash Management Account held by you with one of our listed financial providers. 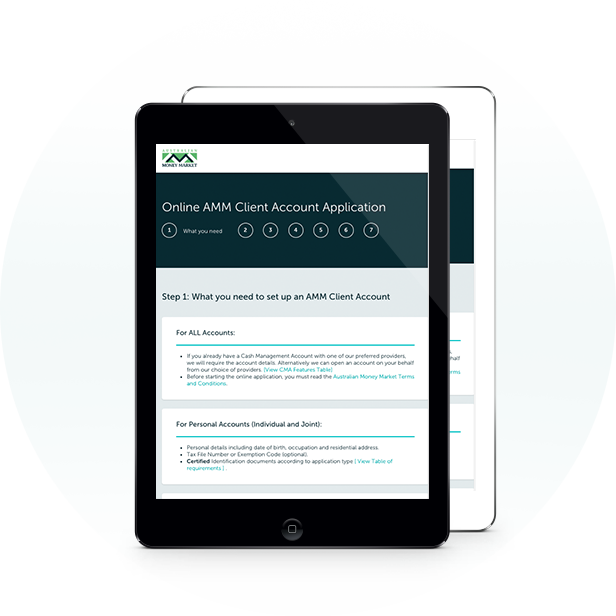 When you complete the online AMM Account Application form, there is an option for existing CMA Accounts where you can provide us with the details. For a list of our CMA Providers, please click here. If your existing CMA Account is not with one of our listed providers, we will require you to open a new CMA Account with a provider from our list. Do I earn interest on my funds in the Cash Management Account? Yes. The interest rate is dependent on the financial institution who you hold your Cash Management with. How does AMM transfer the funds on my behalf? Once you place a Term Deposit deal through your AMM Account, AMM instructs your Cash Management Account provider to transfer the relevant funds directly to your chosen financial institution. Please note, the movement of funds between financial institutions is always in your name. When can I place Term Deposit deals? AMM has standard trading hours from approximately 10.45am until 1.30pm, (Sydney time), Monday to Friday. The 10.45am opening time allows the banks to publish their rates to AMM, which can change daily. The 1.30pm closing time allows AMM the time to process the deal same day and remit the funds to the chosen institution. Your AMM Account provides you with the flexibility to place Term Deposit deals 24/7 in your own time however please be aware that rates outside of our standard trading hours may not be available the next day when AMM is processing your deal during the standard trading hours. Any Term Deposit deal that you place outside of our standard trading hours will be marked as “Pending – rate to confirm”. This means your deal will be placed in a holding pattern until approximately 10.45am the next business day when the rate you placed your deal at will be compared to the current rate issued by the bank. should the rate decrease, the deal will not go ahead and will remain pending. AMM will contact you via email to either confirm the lower rate, or change your instructions. IF we do not receive a reply from you, the deal will be cancelled at 1.30pm and the funds will remain in your Cash Management Account. Will I receive confirmations directly from the banks? Yes. You will receive Bank Confirmation(s) from your chosen institution(s) along with their Product Disclosure Statement (PDS) via an email from AMM. Typically this can take up to two weeks from the deal start date due to the processing time within the chosen financial institution. AMM maintains processes to ensure that any deposits that have not received a Bank Confirmation within 2 weeks of the start date are followed up. How often is interest paid on my term deposit(s)? For term deposit deals of one year or less, interest is paid at maturity. For terms greater than one year, interest is paid annually. Do I get notified about term deposit maturities prior to maturity date? Yes – an email is sent to you 7 days prior and 1 day prior to the date your term deposit will mature. Can I provide Reinvestment instructions before my investment matures? Within 7 days of the term deposit maturing you will be able to provide us with reinvestment or redemption instructions, via your online AMM Client Account. You will see a Redeem and Reinvest button within the relevant term deposit summary. Please note than any reinvestment instruction prior to maturity will be classified as ‘Pending’ until we know what the rates are on the given maturity date. What happens if the rate is different on the date of maturity to my Pending instruction? should the rate increase, the deal will go ahead at the new rate and your Contract Note updated to confirm the new rate. should the rate decrease, the deal will not go ahead and AMM will contact you to receive further instructions. If we can't reach you by 1.30pm (AEST), the deal will be cancelled. should the rate remain the same, the deal will go ahead as requested. What happens if I don’t provide any instructions before maturity? If you don’t action our email reminders (sent 7 days and 1 day prior to maturity) and choose to Redeem or Reinvest on the maturity date, the principal and interest will automatically be transferred into your Cash Management Account and will be available for further instructions. How do you break a term deposit prior to maturity? To break a term deposit, notice is required in writing such as an email sent to admin@moneymarket.com.au. Costs will be attributed to an early redemption and these will vary on a case by case basis. The client is informed of all charges prior to breaking the term. Please note, most financial institutions require 31 days notice to break a Term Deposit and have a 3pm (AEST) cut off time. Please refer to the relevant provider’s PDS for further details. We provide a full history of financial transactions which can be downloaded online at any time including the corresponding bank confirmations. You can also access an interest report and audit certificate from your 'AMM Account Dashboard' which shows a record of deposits placed at a particular point in time. We can keep you up to date with information and news. * Indicative set-up time frames commence when paperwork is received by AMM and assumes all required information has been received. (2) Direct credit funds OUT of your CMA through the AMM platform if input is prior to 1:30pm (AEDT). Note: BOQ and Westpac do not accept this Australian Citizenship Certificate Government Benefits Notice in clients name with their residential address (less than 12 months old) - P.O. Box not accepted Other Australian Bank Statement in clients name with their residential address - P.O. Box not accepted (less than 3 months old). Note: Subject to individual financial institution approval/signoff. For all other entity type, please refer to the table below for details as to what is required. Please note the following exceptions to the standard Certified Identification for Individuals. Foreign National ID Card – the following banks do not accept this: AMP, Arab Bank, AUSWIDE, Bank of Queensland, ING. Foreign Citizenship Certificate – the following banks do not accept: Westpac, Macquarie, ING, Bank of Sydney, AMP, Auswide, and Bank of Queensland. Foreign Birth Certificate – the following banks do not accept: Westpac, Macquarie, ING, Bank of Sydney, AMP, Auswide, and Bank of Queensland. Healthcare Card - the following banks do not accept: ING, Auswide and Macquarie. Commonwealth Seniors Healthcare card - the following banks do not accept: ING, Auswide and Macquarie. Interim Concession Card - the following banks do not accept: ANZ, ING and ANZ Share Trading. Rabo Bank require Will & Probate and Trust Deed only if available. ANZ do not accept Proof of Age Cards that do not have card/reference numbers. 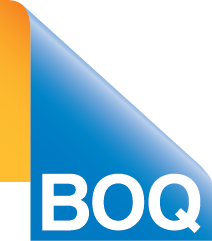 BOQ and Rabo require members of the Super Fund to be in the deed or certified signed application for membership. BOQ, Westpac and AMP require ASIC company extracts for company accounts and corporate trustees of Trusts – this includes beneficial owners that are companies. Auswide require ASIC company extracts for company accounts and corporate trustees of Trusts and Super Funds -this includes beneficial owners that are companies. Arab Bank require at least one form of Primary Identification and one form of Secondary Identifications. At least one form of ID must verify Name, Address and Date of Birth. Macquarie Bank do not accept simply ‘Director’ or ‘Manager’ as an occupation and must be more specific. Macquarie Bank require a mobile number and email address in order to set up an account. The majority of our providers consider the appointer of the Trust to be the controlling person and as such will need to be identified. Majority of our providers require the residential address provided on the drivers licence to reflect the same address on the application. Company ID in ‘Other Entity Types’ – Bank of Sydney, ING, QBank, Auswide Bank & Rabo Bank require certified ID for ALL Directors of a company or corporate trustee. All other institutions require personal details only. Bank of Sydney, Macquarie, Rabo & Suncorp require ID & personal details for all beneficiaries of Trusts. If the beneficiary is a minor Rabo require a certified birth certificate and a notice issued by a School Principal with name and address of the person and the period of time that person attended the school (Less than 3 months old). The majority of our providers will require personal details & ID for the ‘Settlor’ if the settlement sum is over $1,000.00. Direct Debits Your can instruct AMM to direct debit funds from a nominated linked account into your Cash Management Account. There is a three day hold on any direct debited funds before they become available to invest. The funds will earn interest in your Cash Management Account during these three days. Direct Credits You can instruct AMM to make electronic transfers back to a linked account as nominated on the AMM Account Application form. © Australian Moneymarket Pty Ltd.
Use of the information contained on this page is governed by Australian law and is subject to the disclaimers which can be read in the Terms & Conditions.